In his final TV role, Arthur Lowe (Dad's Army) plays a popular but�old-fashioned mathematics master. Arthur Lowe & Harry Andrews. old-fashioned mathematics master attempting and largely failing to keep order among the unruly boys of Form IIIA at Burgrove Preparatory School, in the fictional rural town of Wilminister. 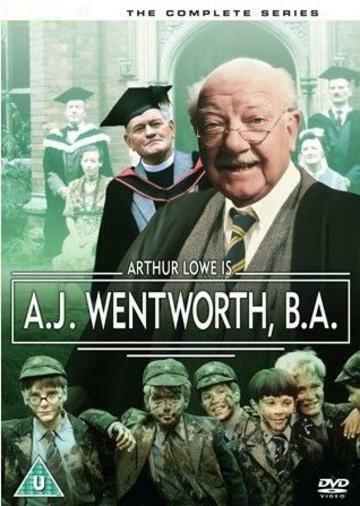 Set in the 1940s, A. J. Wentworth, B.A. skillfully adapts the writings of H.F. Ellis which first appeared in diary form in Punch and later in The New Yorker, before being published in book form; the character of the beleaguered schoolmaster, played to perfection by Lowe, was inspired by Ellis’s own experiences as a teacher. The mild-mannered, accident-prone Mr. Wentworth shows an unceasing dedication to the school and its reputation. But he has two major adversaries to deal with: Burgrove’s headmaster, the snobbish Reverend R. G. Saunders (Harry Andrews), better known as ‘Squid’ by the pupils, and the formidable, frequently combative Matron (Marion Mathie Lucia).